This infantry breastplate is made in the style of a ca. 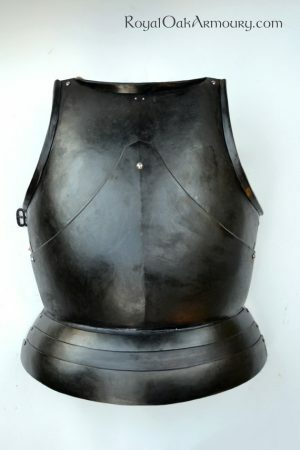 1470 example that was made to be worn without a backplate. The placart design permits a side-to-side movement of the torso, at the same time doubling the protection over the vitals. A short fauld protects the abdomen. The breastplate is held in place by a pair of leather straps that cross in the back. The finish shown is hammer-rough and linseed oil blackened, but could be supplied in a bright or satin steel finish. Made to your measurements and preferences – we would be happy to build a breastplate based on a different original.